Harmless grayish yellowthickening of the conjunctival epithelium in the palpebral fissure. Epidemiology: Pinguecula are the most frequently observed conjunctival changes. Etiology: The harmless thickening of the conjunctiva is due to hyaline degeneration of the subepithelial collagen tissue. Advanced age and exposure to sun, wind, and dust foster the occurrence of the disorder. Symptoms: Pingueculum does not cause any symptoms. Diagnostic considerations: Inspection will reveal grayish yellow thickening at 3 o'clock and 9 o'clock on the limbus. The base of the triangular thickening (often located medially) will be parallel to the limbus of the cornea; the tip will be directed toward the angle of the eye (Fig. 4.2). Differential diagnosis: A pingueculum is an unequivocal finding. Treatment: No treatment is necessary. Triangular fold of conjunctiva that usually grows from the medial portion of the palpebral fissure toward the cornea. 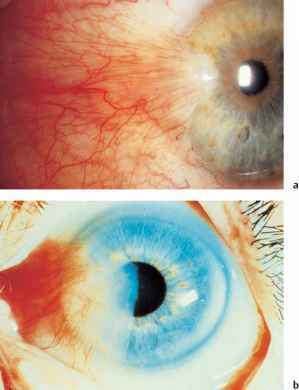 Epidemiology: Pterygium is especially prevalent in southern countries due to increased exposure to intense sunlight. Fig. 4.2 Harmless triangular pingueculum whose base is parallel to the cornea (arrow). Etiology: Histologically, a pterygium is identical to a pinguecula. 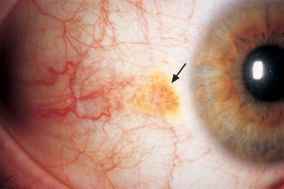 However, it differs in that it can grow on to the cornea; the gray head of the pterygium will grow gradually toward the center of the cornea (Fig. 4.3a). This progression is presumably the result of a disorder of Bowman's layer of the cornea, which provides the necessary growth substrate for the pterygium. Symptoms and diagnostic considerations: A pterygium only produces symptoms when its head threatens the center of the cornea and with it the visual axis (Fig.4.3b). Tensile forces acting on the cornea can cause severe corneal astigmatism. A steadily advancing pterygium that includes scarred conjunctival tissue can also gradually impair ocular motility; the patient will then experience double vision in abduction. Differential diagnosis: A pterygium is an unequivocal finding. Treatment: Treatment is only necessary when the pterygium produces the symptoms discussed above. Surgical removal is indicated in such cases. The head and body of the pterygium are largely removed, and the sclera is left open at the site. 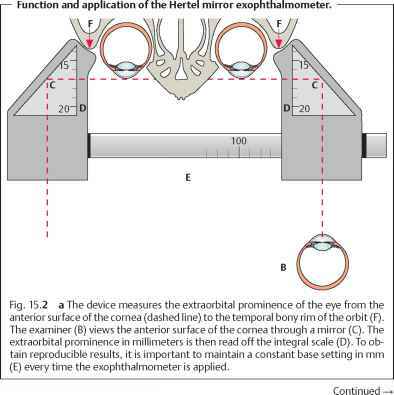 The cornea is then smoothed with a diamond reamer or an excimer laser (a special laser that operates in the ultraviolet range at a wavelength of 193 nm). Clinical course and prognosis: Pterygia tend to recur. Keratoplasty is indicated in such cases to replace the diseased Bowman's layer with normal tissue. Otherwise the diseased Bowman's layer will continue to provide a growth substrate for a recurrent pterygium. Fig. 4.3 a Triangular fold of conjunctiva growing from the medial portion of the palpebral fissure toward the cornea. b Pterygium that has grown on to the cornea and threatens the optical axis. I ought to change, but I've attempted and failed. Does this seem familiar? Frequently, altering habits does seem insurmountable. A lot of us merely don't have enough motivation to alter our habits all of our foul habits in a way that would really affect our life. We hold them tight as we view them as rewards. But your habits determine your life. 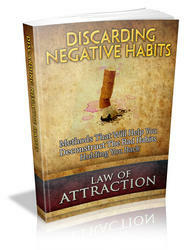 Discarding Negative Habits Methods That Will Help You Deconstruct The Bad Habits Holding You Back.